Get your hands on a new plank and make the most of some decent savings on our favourites. There are a handful of savings going on across PC gaming items, components and peripherals at some retailers right now, but we've picked out some great discounts on some of our best keyboards, because they seem to be well priced right now. 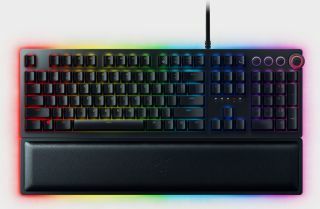 The best at the moment is a healthy 40-odd quid off the Razer Huntsman Elite keyboard—which sits near the top of of our best gaming keyboard list. That's as cheap as this plank has ever been, even if it's still a fair wedge of cash. Elsewhere our number one keyboard also has a bit of money off. The HyperX Alloy Elite has a solid 20 percent off at Amazon too. The Alloy Elite has a simple aesthetic and all the features we'd expect in a top plank: detachable wrist rest; USB passthroughs; media controls; and back-lighting. It'll be very much worth your investment. However, it's been cheaper during retail events like Black Friday. A little more expensive, but with the features and flash to go with it, our number 2 gaming keyboard at the moment, the Corsair K95 has £35 off at Amazon. This one is has more bang for your buck with media controls, a USB pass-through, a metal volume wheel, RGB lighting and even an extra set of textured keycaps for the WASD buttons. Any of these are premium performers in the realm of gaming keyboards so you can have total confidence in going with whatever takes your preference out of these banging planks.